The Coalscing Plate Packing System provided by us is highly demanded in the industrial sector because of its ease of installation and lower needs for maintenance. This pack boasts of unbeatable quality and pricing. The photograph shows High Pressure System comprising of compressor, vessels piping & valves on a skid mounted unit. Operating pressure 135 bar medium air. These can be customized as per the specific requirement of our clients. Moreover, our range is offered at market leading prices. Samarth Engineers is engaged in manufacturing a wide range of Process Equipment for Chemicals Industry. Filters, Burners, Pumps, Finned tubes for heat exchangers, Coolant screw pumps. A water header is a very important component and required in array of industries. we use the finest grade of raw material that is obtained after rigorous testing so that the water headers that we manufacture are sturdy, durable and have al long life. The water header has a metal body with outlets on the surface. 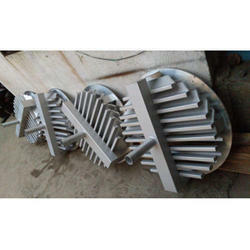 We offer to customize the water headers as per the needs of the clients. - Manual to Auto Mode with selectable rate in Percent/sec.